Day 1 - arrival in Kangerlussuaq. Flight to Nuuk. Even though there are many settlements in this part of Greenland, but often there is only a moderately well-developed infrastructure (docks). Above Greenland has an extremely changeable weather. This makes the cruise a pure expedition! Our route depends on the weather and especially the ice conditions. The experienced captain and expedition leader will set the route on a daily basis and plan according to the local conditions, to provide the best experience of the expedition. Planned visits are: Nuuk - Greenland's capital is the largest city of Greenland with 16,000 inhabitants, even if it is one of the smallest capital cities in the world. A few kilometres further north than Reykjavik, it is the northernmost capital of the world. Here old traditions meet modern change. In the National Museum you may see the mummies of Qilakitsoq and admire the evidence of a past culture. Sisimiut - the second largest city of Greenland s known for his adventure sports and the many Greenland sled dogs. The Sisimiut Museum presents a special exhibition of the settlement history dating back 4,500 years. Qeqertarssuaq - is located on the volcanic island of Disco The small village Qeqertarssuaq was founded in 1773 as a whaling station and is one of the oldest settlements in Greenland. At Qeqertarsuaqs is the octagonal church popularly called just "the ink of our men". On a black sandy beach, quite often icebergs are sranded - great photo opportunities. Ilulissat - the name of the village could not have been selected better: Ilulissat means "Icebergs" and they are pushed by the ice in unimaginable quantities into the open sea. One of the most productive glaciers in the world is responsible for this mass of ice. 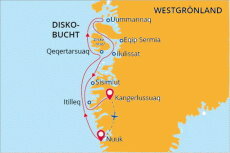 During a hike or boat trip unforgettable views are being offered.. Today a Museum is housed in the birthplace of the famous polar Explorer Knud Rasmussen and a visit of the Museum of fine arts is also recommended. Paamiut - the picturesque settlement of Paamiut is situated on the Kuannersooq fjord. One of the most beautiful churches of Greenland is the pride of the village. The Church was built in 1909 in wood and in the Norwegian style. Off the coast, one has good opportunities to meet on humpback and fin whales, and eagles. Day 9 – our last morning We leave the ship after breakfast in Kangerlussuaq and transfer to the airport. - Full Board on board including snacks, coffee, tea.